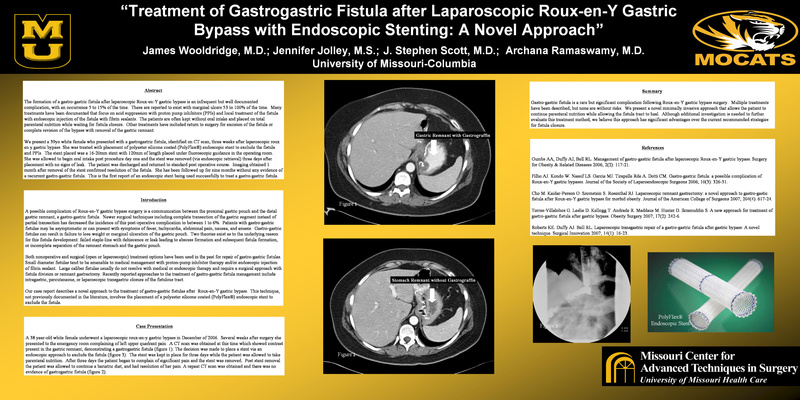 Treatment of Gastrogastric Fistula After Laparoscopic Roux En Y Gastric Bypass with Endoscopic Stenting: A Novel Approach. INTRODUCTION: The formation of a gastrogastric fistula after laparoscopic roux en y gastric bypass is an infrequent but well documented complication, with an occurrence of 5-15%. These are reported to exist with marginal ulcers 53-100% of the time. Many treatments have been documented that focus on acid suppression with proton pump inhibitors (PPIs) and local treatment with endoscopic injection of the fistula with fibrin sealants. The patients are often kept without oral intake and placed on total parenteral nutrition while waiting for fistula closure. Other treatments have included returning to surgery for excision of the fistula or complete revision of the bypass with removal of the gastric remnant. METHODS: We describe a 39 year old white female who three weeks after a laparoscopic roux en y gastric bypass, presented with a gastrogastric fistula identified on CT scan. She was treated with PPIs and placement of a polyester, silicone-coated endoscopic stent (PolyFlex®) to exclude the fistula. A stent with a 20mm flare, 16mm diameter, and 120mm length was placed endoscopically under fluoroscopic guidance in the operating room. RESULTS: The patient was allowed to begin oral intake on postoperative day one, and the stent was removed endoscopically on postoperative day number three. The patient was discharged to home one day after stent removal and returned to a standard postoperative gastric bypass course. Imaging obtained one month after removal of the stent confirmed resolution of the fistula. She has been followed for nine months without any evidence of a recurrent gastrogastric fistula. CONCLUSION: This is the first report of an endoscopic stent being used to successfully treat a gastrogastric fistula. With more experience, endoscopic stent placement may play a vital role in treating gastrogastric fistulas.